You work hard to make your yard look nice. When you mow the grass, you leave the clippings to keep it looking lush. It is full of native plants like blue flag iris (Iris versicolor), cardinal flower (Lobelia cardinalis), turtlehead (Chelone glabra), and milkweed (Asclepias syriaca) that attract fascinating pollinators, such as monarch butterflies, and feed your local farm's honey bees. Every fall you rake the beautiful ochre and crimson leaves, enjoying the crisp fall air. Everything is looking perfect, but there is something on the edge of your property that could ruin it all. Some of these invaders are beautiful and showy, making you think they might look good next to your irises and cardinal flowers. Purple loosestrife (Lythrum salicaria) is a terrestrial plant that thrives in wet areas but can live anywhere and boasts big, flashy magenta flowers in late summer. However beautiful, purple loosestrife will quickly crowd out all of your native wetland plants, turning your garden into a monoculture and attracting less pollinators. Look for square stems, small leaves with smooth edges (not toothed or saw-like), and the unmistakable flower head. If you find purple loosestrife, don't panic; it can easily be removed by digging it up, putting it in a black trash bag, and leaving it in the sun to solarize for two weeks or more. Solarizing makes sure the plant is completely dead and won't continue to grow in its new location like the landfill. Make sure you get all of the roots and pick up any plant pieces that may have broken off. Be wary when buying nursery plants. European wand loosestrife (Lythrum virgatum) is marketed as a sterile, safe alternative to purple loosestrife. However, the two species can cross and therefore continue the spread of the invasive. 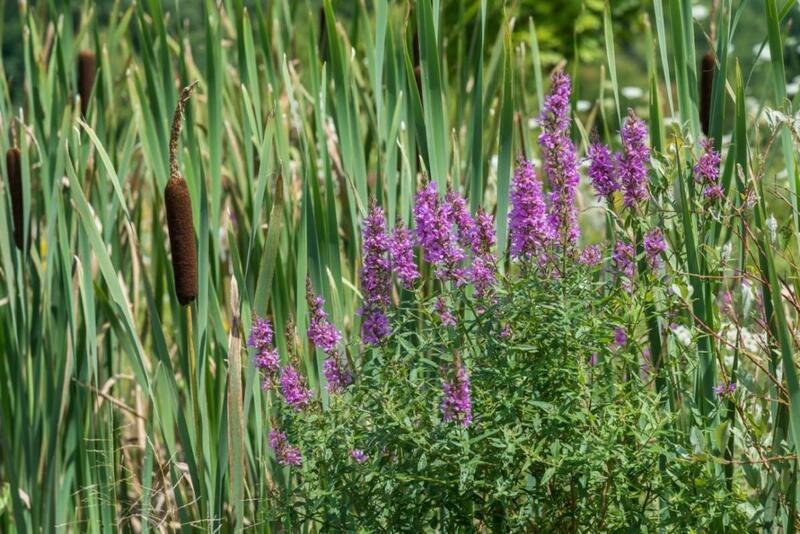 Purple loosestrife among native cattails. These two species directly compete for the same habitat. Maybe you have also noticed a bamboo-like shrub on your property line growing fast and tall. It might look like a good hedge for privacy, but don't be fooled. Unlike a cedar hedge, for example, this plant will quickly grow out of control. 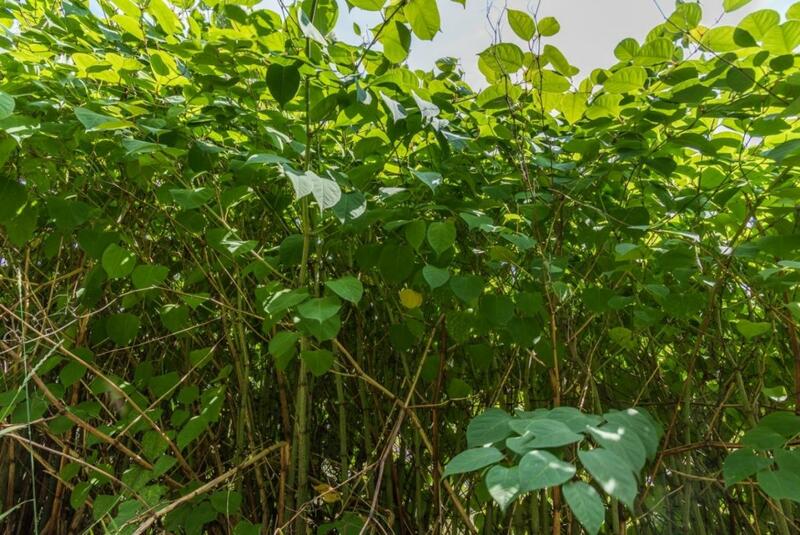 Japanese knotweed (Fallopia/Reynoutria japonica) is an aggressive invader, establishing quickly in disturbed areas and spreading rapidly along stream banks, lake shores, roadsides, and other open areas. It grows quickly in any condition, outcompeting early succession native plants. Its shallow root system can promote bank destabilization and erosion, causing excess sediments to enter and pollute streams. In Brook Trout streams, this excess sediment can smother habitat, and the presence of knotweed means there are less shade trees such as hemlocks, which keep water temperatures cool. Look for plants with distinctive bamboo-like stalks with large leaves that alternate along the stem and are flat on the bottom edge. In late summer, it produces small, feathery white flowers along the tops of its stems. Removal of Japanese knotweed takes time and dedication, as its rhizome roots can persist in the soil and grow new shoots even after old ones have been completely killed. If you see a small infestation, try to remove it by hand and carefully dispose of all plant parts, making sure to solarize as described above. Large infestations typically require manual removal and multiple chemical treatments with herbicide. Japanese knotweed is easily distinguished from native plants due to it's bamboo-like stem, which is edible. With most invasive plant infestations, eradication is much easier when the infestation is small, so protect your beautiful yard and take action as soon as you see any invasive plants. To find out more about terrestrial invasive plants and what you can do if you see them on your property, contact AsRA's River Steward, Nicole.